The summer flew by and it’s that time of year again. School is right around the corner and it’s time to get your kids pumped up again after the lazy days of summer. Whether your child is just starting preschool or a classroom veteran, the transition can be tough, but it doesn’t have to be! At Mom Trusted, we have a few tricks up our sleeve to make getting your kids ready to head back to school as easy as pie. If bedtimes and wakeup times have shifted later during the summer months, it’s time to slowly start readjusting to school night bedtimes and school morning wakeups. If your children are off by an hour or two, try shifting by 30 minutes each week. If you make the change too quickly, you’ll end up with crabby kids so slow and steady is key. 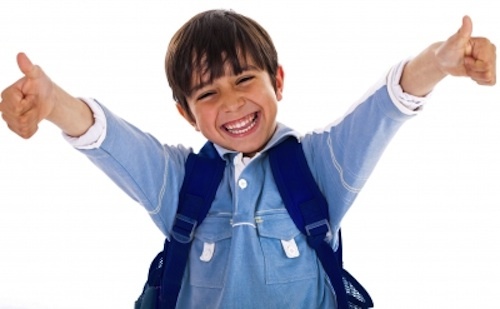 Right before the school year starts is a great time to set up your kids’ annual check-up. This way, you can make sure everyone’s healthy and knock out any mandatory vaccinations in the same visit. Remember that many parents schedule their children’s check-ups this time of year so plan ahead. Call to set up an appointment now. A lot of people think of clothes when they hear the phrase “back-to-school shopping,” but new sneakers and sweaters shouldn’t be the only items on your list. Visit your child’s school website or call to find out about the mandatory school supplies. Odds are, you’ll need some pens, pencils, notebooks, folders, glue, scissors and whatever else the teacher recommends. Help make the transition easier on you too! Spend the next few weeks cooking large meals that freeze easily and are just as tasty reheated. Think stews, soups and casseroles. Freeze the leftovers so that you can heat up some simple meals for the family when schedules get hectic.